When we go into a mode of deep thought and try to portray a picture of our esteemed Bibi Fatima a.s., the most prominent picture that comes to mind is of love. Fatima a.s. is love – a love of the purest kind. Love for her beloved mother – Ummul Momineen, Bibi Khadija a.s; love for her father – Rahmat ul lil Alameen, Prophet Mohammad s.a.s. ; love for her husband – Ameer ul Momineen Ali ibne ibi Talib a.s; love for her daughters – Bibi Zainab a.s. and Bibi Umme Kulsoom a.s.; and love for her sons – Imam Hasan a.s. and Imam Husain a.s., masters of the youth of paradise; love for her maid – Bibi Fizza a.s., the Ethiopian princess. Islam became a complete religion because of Fatima a.s. She is the unparalleled exemplary link between Nabuwat (Prophethood) and Imamat (leadership of our 12 Imams). The daughter of Prophet Mohammad s.a.s. married Ali ibne Abi Talib a.s. Imamat, was entrusted to Imam Ali a.s. by the command of Allah s.w.t., passed on to the children of Bibi Fatima a.s. Imamat remained in the progeny of Prophet Mohammad s.a.s. through our esteemed Bibi Fatima a.s. and her patrilineal offsprings who received it from generation to generation until our 12th Imam a.s. All our Imams, except Imam Ali a.s., inherited Imamat for being the children of Bibi Fatima a.s. bearing the genealogy of Prophet Mohammad s.a.s (see Peshawar Nights for more details). Bibi Fatima a.s. therefore encompasses Nabuwat and Imamat and completes the circle of love which no male child of our Holy Prophet a.s. would have been able to accomplish. This is the unique characteristic of a girl child as revealed to us by our Creator, Allah s.w.t. She was a fruit of love from Jannat, given to Prophet Mohammad s.a.s. for being His most beloved Prophet. She was not sent to this earth, rather, Prophet Mohammad s.a.s. had to ascend to Jannat to receive her (as mentioned in Fatima az-Zahra’, The World’s most outstanding Lady by Ayatullah Naser Makarem Shirazi). As a baby her cradle was rocked by her beloved mother, a lady of remarkable status who was the first woman to openly accept Islam when the first verses were revealed to Prophet Mohammad s.a.s. She was a believer, her husband’s staunch ally and his best friend and supporter through all his trials. A mother is a unique creation of Allah s.w.t. It is not an exaggeration to say that a mother is an extension of Allah’s will in providing nourishment and protection to a helpless child that cannot fend for itself. Allah physically protects a child through its mother. The unique bonding of a mother to her child and of a child to its mother is not short of a miracle. Only a mother is capable of fulfilling her duties she takes upon herself and the sacrifices she makes for the sake of love. No other relationship compares to what a mother does for her child. Bibi Fatima a.s. was so revered by her father, Prophet Mohammad s.a.s., that he respectfully got up from his seat every time Bibi Fatima a.s. walked into his presence. He would then offer his seat to her and would sit beside her. He taught to all those people who surrounded him how to respect their daughters and their women by setting an example himself by being respectful to them. Those who had buried their daughters alive with their own hands had much to learn from our Holy Prophet and his family, our Holy Ahlebait a.s. When she married Imam Ali a.s., Bibi Fatima did all her house work herself. Her beloved maid Fizza a.s. was given the luxury of a family member while Bibi Fatima a.s worked. The household work was divided equally between Bibi Fatima a.s. and her maid Bibi Fizza a.s. There was no discrimination between the mistress of the house and the maid of the house. The children respected the maid like their own mother. Bibi Fatima a.s. worked hard to raise her children. In times of financial difficulties she worked harder and maintained the standard of their livelihood so the children did not get neglected or go unnourished. She worked on the stone grind mill and made flour from whole grain and fed her children. She worked so hard that Prophet Mohammad s.a.s. gave her a tasbeeh to recite for keeping up her devotion to Allah s.w.t. when there was not much time for the prayers she wished to perform for her Creator, Allah s.w.t. Allah s.w.t. revealed the status of Bibi Fatima a.s. to us in Hadees e Kisa. When the household of Allah’s prophet joined him under the Kisa and collected together under one sheet of fabric, Allah s.w.t. introduced the personalities under the Kisa. He said they are the household of Prophethood. At the core of the Message was Bibi Fatima a.s. who was the thread that made this fabric possible and the ultimate cause of this meaningful event planned by Allah s.w.t. Jibraeel’s words as they came from Allah s.w.t. regarding who was under the Kisa – they are Fatima (a.s.), her father, her husband and her sons. For those of us who do not know or ignore her position, such was the status of our dear Bibi Fatima a.s. that she was the link that kept the most prominent people in Islam as one household (Fatimah in the Qur’an and the Sunna). 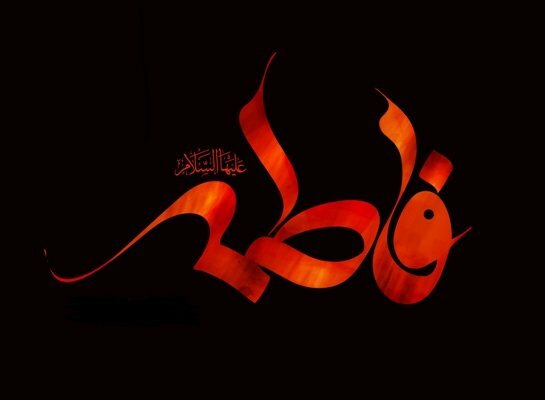 Upon her father’s death, Bibi Fatima’s a.s. personal property was taken away from her because this precious property was a great asset and would have given the household of the Prophet a much needed financial support to sustain themselves and a lot of needy Muslims the sustenance without delving into poverty. This was a great political move devoid of Islamic justice or moral. With their basic needs fulfilled, the Prophet’s household would have the strength to resist the changes that were being brought into Islam. The brave Bibi Fatima a.s. who was raised by none other than the most noble man who walked the earth, declared her claim for Fadak as it was the property of her father gifted to her by her father who received it as bounty after the Battle of Khayber. But her claim was refused saying that the property of the Prophet was public property. Bibi Fatima a.s. raised her voice against this open injustice (A Shi’ite Encyclopedia ): Bibi Fatima a.s. who lived a simple life, who fasted for days together, who worked hard, who did not care about worldly comforts and possessions, took it upon herself to fight against this injustice to set an example to the women of the world for ages to come that they should stand up against injustice and fight for what is rightfully theirs. The eloquent Qutba delivered by Bibi Fatima a.s. in the court illustrates her knowledge, her understanding, her courage, demonstrating she was equipped with the power of the Holy Quran to support her claim of her inheritance. This was the power of Bibi Fatima a.s. It is not easy for any woman to stand in the court of the Caliph and protest his decision especially when he is also the one who is possessing the power to pass the judgment. But that did not stop the brave lady from appealing for her property. For those of us who look upon her as our benefactor and role model, she was setting an example for us to be brave in the face of adversities. Fatima a.s. took care of her father while her mother was alive and continued to do so after her death. She tended to his wounds inflicted by the Quraish following the death of his protector, his Uncle Abu Talib a.s. She nurtured her father and took care of his needs with such great care that the Prophet referred to her as his mother – Umme Abiha – mother of her father. The caring daughter of our Prophet was also a doting mother to her children. Bibi Fatima a.s. raised her children with a lot of hard work. She did all the chores of the household and her maid Fizza shared her work equally on alternate days. She kept the family glued together with her love for her children, her patience, her benevolence, her prayers and her sacrifices. The legacy: of this only child of Prophet Mohammad s.a.s. Bibi Fatima a.s is she is Sayyadatun nisa il Alameen. She is the leader, the best of all women in the world and a wonderful role model. In addition to being a wonderful daughter and mother, she displays the image of Muslim women in society. Her character exudes the strength of Muslim women. She is easily the greatest woman in this world. May ALLAH (swt) increase your Tawfeeqaats and count you amongst the lovers and helpers of of Imam e Zaman (atfs) who is the avenger of oppression done on AHLEBAIT (as) . MashaAllah may Bibi Zahra s.a accept this from you and make it the reason for you to be in the nearest place to her palace in heaven.. Very very beautifully written. U have made us women who look up to Her very proud. Indeed our Bibi Fatima a.s.a is the one and only. Mashallah May shahzadi Fatima (Sa) bless you for such a beautiful article subhan Allah. Well done beti, much needed information specially for all women of all religions! Shahzadi is not only naimat(blessing) for us but also as per or our imams she is naimat n hujjat for them also! thank you for this piece, and may almighty Allah be please with her.